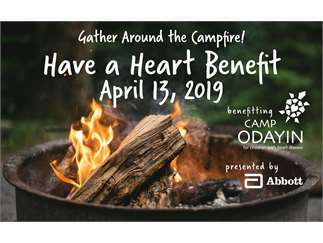 Gather around the campfire with Camp Odayin! All proceeds from the 19th annual Have a Heart Benefit send amazing children with heart disease to camp! This evening event includes dinner, complimentary wine, games, a silent auction and music by "The Voice" finalist Chris Kroeze. The program is emceed by Kare 11's Rena Sarigianopoulos. Camp Odayin provides medically safe and emotionally supportive camp experiences and community building opportunities for young people with heart disease and their families. Congenital Heart Defects are the #1 birth defect impacting over 40,000 children each year. We are a MN-based organization and we hold camps in MN and WI - last year we had 323 summer campers and 402 family campers. We only charge $25 per session and we rely heavily on fundraising as well as our amazing camp counselors, cardiologists and nurse volunteers (over 302 volunteers last year! ).